Prime Management’s Leadership and Management consulting and education services are dedicated to the development of personal, interpersonal and professional non-technical skills at all levels of your organization. Our objective is to offer personal contact, ready access to senior experienced practitioners and consultants, a high level of expertise in areas of relevance to corporate and government organizations, highly-qualified resources to manage projects of all sizes, and a problem-solving capability to assist in resolving conflicts. We help you to execute on your strategies by providing courses that can be delivered on-site, off-site, and through personalized coaching. Workshops and courses can be customized or designed from the ground up for your unique needs. The range of professional development interventions extends far beyond traditional “classroom training”, and includes individualized coaching. 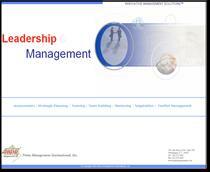 Click here to view our Management & Leadership Brochure(.pdf file).